Waking Green Dragon: The Sleeping Elephant: Will The Dragon Wake Up? The youth of China are asleep. As a teacher, I see it everyday: children asleep at their desks; taking cat-naps between classes, cutting into their equally scarce social time. I talk to people my age and they say it has been this way for a long time and there is always talk, but no action when it comes to addressing it. I spoke with some girls last evening who live in one of middle school dormitories. (Middle schoolers here are more like high school age.) They have study rooms with lights on until midnight. The light does not go out in their rooms (each with six or eight tenants) until eleven o'clock. They have to be at school at 7:20 AM. The sleep hours of the elementary and middle school students in China have continually declined in recent years. Nearly 80 percent of respondents did not have enough sleep. According to the survey conducted in 2010, the elementary and middle school students slept an average of 7 hours and 37 minutes per weekday, 1 hour and 22 minutes fewer than in 2005 and 1 hour and 23 minutes fewer than the minimum national standard. More than 78 percent of respondents slept fewer than nine hours per weekday in 2010, increasing by 32 percent from 2005. The respondents slept an average of 7 hours and 49 minutes on a weekend day in 2010, 1 hour and 47 minutes less than in 2005, and 1 hour and 11 minutes less than the minimum national standard. Nearly 72 percent of respondents slept less than 9 hours per day on weekends in 2010, up nearly 42 percent from 2005. "Heavy schoolwork, bad study habits and long commuting times have all contributed to their sleep shortage," said Deng Xiquan, a researcher at the China Youth and Children Research Center. Reacting to the criticism, China formulated a 10-year national education plan (from 2010 to 2020) last July, pledging to build an assignment-burden monitoring and reporting mechanism to lessen the pressure on primary and secondary school students. It is hard to see how assignment-burden monitoring is going to make a dent in the real problem, which is a ridiculously long school day. I work part of the time at the Middle School Attached to Northeast Normal University. These students don't leave school until 7:10 PM. One of my students told me it is the best school in Jilin Province ("Of course!" she added). This same student brought me a couple short essays, of her own accord, to mark with red pen. Her writing ability in English is excellent, but I wonder how she comes to my optional TOEFL class from 7:20 PM to 8:50 PM and still maintains her cheery disposition. 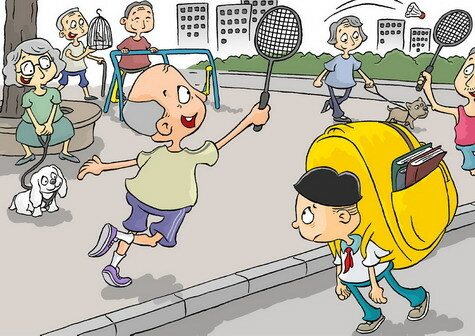 This cartoon by Hao Yanping depicts a child carrying a heavily loaded school bag, looking enviously at retirees exercising in a playground. A number of surveys have found that children are unhappy due to long school hours and growing pressure from parents to study hard. China's adults are asleep at the wheel on this one. Jane Brody's article in the New York Times this week provides a myriad of reasons not to cheat yourself on sleep. "Its benefits include improvements in concentration, short-term memory, productivity, mood, sensitivity to pain and immune function, " she reports. Will the grown-ups please do something?